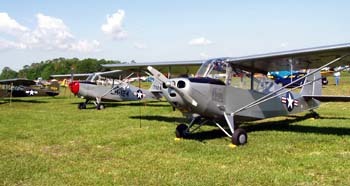 Aeronca Champ, Chief, Sedan, L-3 (O-58), L-16, Defender, C-2, C-3, Models 50, 65, series K et al. We promote these capable and historic aircraft through their preservation and maintenance, and celebrate their History. 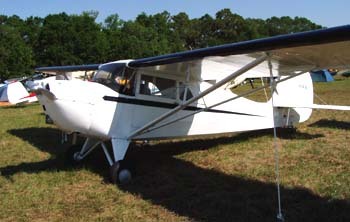 The Aeronca Aviators Club welcomes all owners, pilots and enthusiasts of these fine aircraft. Champ Conversion to Grove Hydraulic Brakes, have been compiled in a new book including Jim Spee's article, additional installation pictures, field approvals (337s) and supporting documents all provided by Jim Spee. Order A-617 from our Aeronca Store or call the office for your copy. Sun getting in your eyes? Check out our SunShield for the Champ and L-16 (also works on Citabria, Decathlon and Scout). We have received an Airworthiness Concern from the FAA regarding potential problems with the 15AC Sedan's wing spars. You can read / download it from Here. If you decide to respond, please send a copy of your letter to Us as well. Another Airworthiness Concern has been issued; this one includes all carburetors. You can read / download it from Here. If you decide to respond, please send a copy of your letter to Us as well. 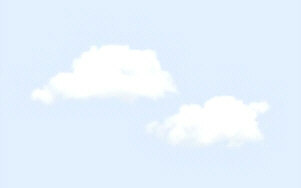 Our New Aeronca-only Forums are now live! Come and participate. The New Champ is now being delivered! 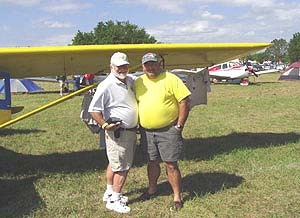 The January and April 2006 issues included pictures and details of the new American Champion LSA Champ (right). A great deal of confusion has been caused by the newly issued Control Cable AD. We try to make sense of it here. Updated with new information 1/31/2006. The Aeronca Store is now open - you can order T-shirts, hats and some of our Publications using our Secure Server. 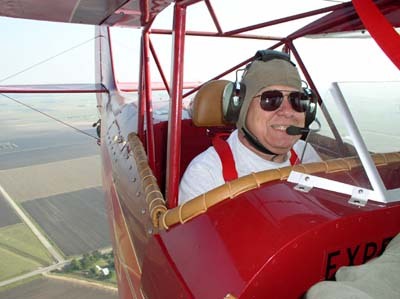 Carl White at the helm of his JYD - a homebuilt counterpart to the Citabria Pro, built from Aeronca organ donors. See Member Project page for more. Photo by Mike Rountree. 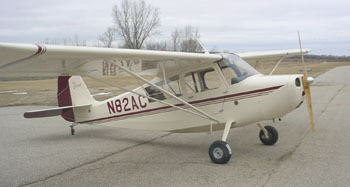 Read about its Long Time Abornin' in the January, April and October 2006 issues of Aeronca Aviator. to Sun 'n Fun by its restorer Ted Davis. 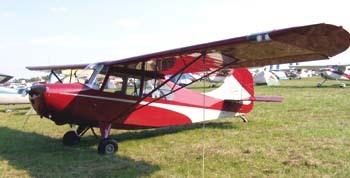 It was on display in front of the Type Club tent at AirVenture 2005, where he won the Contemporary Bronze Lindy! Click here for our report from AirVenture Oshkosh 2004! © Copyright 2004-2019 Aeronca Aviators Club. All rights reserved.